Upon finishing the 2nd season of Orange is the New Black this week, I realized I could put together a great list of binge worthy tv shows. There is something so great about not having to wait a week for a new episode and being able to indulge in a couple episodes every night (or more if you wish). What would have kept us entertained during The Terrible Awful Norovirus of 2013 or anytime the South experiences some snow or should I say snowpocalypse or a rainy Saturday when you just want to be lazy. 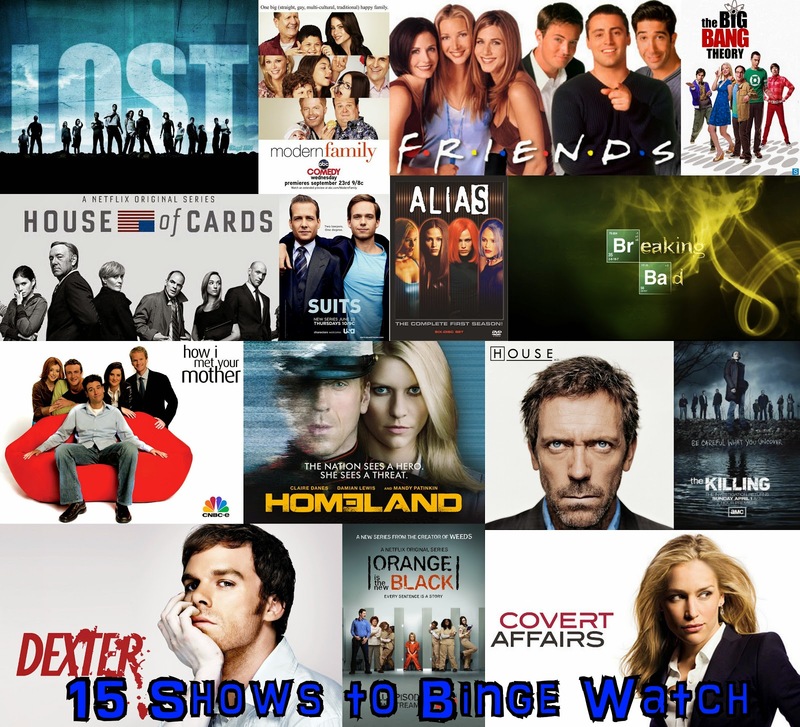 I know there are tons of lists of great shows to binge watch but here are 15 we have truly enjoyed. And some that are still airing we are continuing to enjoy and try save up a few episodes at a time to at least do a mini binge-watch unless an entire season is released at once like House of Cards or Orange is the New Black. Great job Netflix, that's how you create binge-worthy television. So here they are in no particular order. 1. Lost - 6 seasons; This was my first ever binge-watching show started during a terrible summer cold my 2nd summer in Charlotte as encouraged by Eric. Watching continued through the rest of the summer so I could catch up to where Eric was who had been watching week by week since the beginning and then we were able to watch the last 2 seasons together live. It is about the survivors of a plane that crash lands on a island where pretty crazy things happen (it gets crazier as the seasons progress... I'm convinced the producers didn't set out knowing how they would end the show) as they all try to stay alive. 2. Dexter - 8 seasons; Centers on a Miami Police Department blood spatter analyst, Dexter, who has a second job as a secret serial killer (true passion channeled into only killing terrible criminals that have gotten away). You will find yourself rooting for Dexter as he tries to lead a "normal" life with his desires for blood/killing. 3. House of Cards - 2 seasons, still airing; A successfully manipulative and power-hungry majority house whip, Frank Underwood, and his equally manipulative wife take you along as they methodically climb the ranks in present day Washington D.C. I wasn't sure I'd like this series as I'm not really into politics but Kevin Spacey is brilliant as the scheming and ruthless Frank who believes his bad actions are for the greater good. 4. Homeland - 3 seasons, still airing, Centered around a CIA assigned to the counter terrorism center (Claire Danes). She suspects a man who is a newly returning prisoner of war of being "turned" by al-Qaeda but does not have any concrete evidence of this so she takes the investigation into her own hands. As an added bonus for us (and anyone else in the area) much of the first three seasons were filmed in Charlotte so it's cool to recognize places around the city. 5. Breaking Bad - 5 seasons; A crime drama about a married high school chemistry teacher (Walt) in New Mexico with a disabled son and new baby on the way. Walt is just diagnosed with lung cancer and shortly after goes on a ride along with his DEA brother in law and gets the idea to team up with a former drug addict student to produce and sell meth to leave his family with enough money when he dies while keeping it a secret from everyone else and especially his wife and brother in law. Seemed like I wouldn't like this show just based on the description but I promise it hooks you. Sort of like in Dexter, you find yourself start to cheer on Walt in his life of crime and hope that he doesn't get caught. It is the highest rated show of all time and has received numerous awards for good reason. 6. Friends - 10 seasons; A classic for sure that doesn't even really need explaining because who hasn't seen at least one episode of Friends. A few years ago we realized we hadn't seen all the episodes so we watched them all from start to finish (thank you Target Black Friday tv series sale) and it was just as great as the first time I'd ever watched an episode. Definitely a show that makes you laugh and feel happy and relate to at least one of the characters at one time or another. Who wouldn't want to have friends like them? Reunion episode pretty please? 7. Orange is the New Black - 2 seasons, still airing; based on a true story of a woman in her 30's who goes to a minimum security women's prison for something crazy she did as a young adult. It is about everything that happens while she is in prison (full of very interesting prison characters and guards) and what is going on in her former life outside. I wasn't sure I'd like this show (I seem to say that a lot in this post) but 2 episodes in and I was hooked. Can't wait for the next season. 8. Alias - 5 seasons; Created by JJ Abrams, it stars Jennifer Garner as Sydney, a CIA agent. She keeps her job hidden from her friends and family while assuming different aliases to carry out missions (hence the name) mainly in foreign countries. It's a litle bit of Covert Affars with some mythology and science fiction thrown in. 9. How I Met Your Mother - 9 seasons; As the name suggests it is based on the premise of the main character, Ted Mosby, telling his two teenage kids the unabridged story of how he met their mother years ago. It follows the life of Ted and 4 of his close friends in Manhattan. I'd say it is similar to Friends and definitely will bring a lot of laughs. 10. Modern Family - 5 seasons, still airing; Follows Jay Pritchett, his second wife, his stepson, and his two grown children who each have families of their own in suburban LA. The families and characters are all so unique and this has us laughing out loud frequently. This is one we usually can't save up any more for binge-watching and look forward to the new 30 minute episode each week during a season. Reruns frequently air on the USA channel and I'd be lying if I said we didn't sometimes rewatch an episode. 11. The Killing - 3 seasons, 1 more short season to come later this year; Set in Seattle, it follows various murder investigations by two homicide detectives. While many other detective shows resolve a case in one episode and move on to a new investigation in the next, this show has a longer and more mysterious cases/investigations which is probably more realistic. It had us on the edge of our seats many times trying to figure out who the killer was. 12. Cover Affairs - 4 seasons, 5th season starts June 2014; About a young CIA operative in the Domestic Protection Division in Washington D.C. and her blind tech operative who is her guide on missions near and far. 13. Suits - 4 seasons, 4th season airing now; Centered around a young impressively smart but kicked-out of law school guy (Mike) and a real lawyer (Harvey) who is the best closer in NYC. Through a random run-in at a job interview Mike completely impresses Harvey with his honesty and knowledge. Harvey hires Mike, passes him off as a lawyer to everyone and takes him under his wing as they solve cases together at a prestigious law firm while keeping Mike's complicated secret that he isn't actually a lawyer. 14. House - 8 seasons; Medical drama starring Dr. House, an unconventional, distrusting medical genius, and his team of doctors that make up the diagnostics department who solve cases no one else can solve. House often is in conflict with everyone around him which makes for interesting problem solving when lives are on the line. 15. Big Bang Theory - 7 seasons, still airing; So we only binge watched the first two seasons because then we were caught up and have watched it each week since during a season but if you haven't been watching all along you should binge watch the first 7 seasons to catch up (it was just renewed for 3 more seasons!). This sitcom follows two nerdy scientist roommates in LA, one who has a major crush on the girl in the apartment across the hall and the other who is neurotic child genius with no interest in emotions or socials norms or understanding of irony and sarcasm. It follows their lives along with two of their equally nerdy and awkward scientist friends and the girl across the hall to round out the group. My parents like this show as much if not more than we do so I'd say the show is great and funny to adults of all ages. What are some of your favorite binge-worthy watching shows? I think next we might try Scandal since we've heard good things about it and it's on some binge-watch tv show lists I've seen.